Just in case you've been out of the hi-fi scene for a few years and missed it, the story with Audiolab is that it was a very successful amplifier brand, taken over and turned into TAG McLaren Audio, which, sadly, failed and sank. The Audiolab brand was salvaged from the wreckage, though, and lives on with a product range that is (externally at least) similar to those of old. This CD player sits alongside an integrated amplifier, preamp, stereo and mono power amps, home cinema products and even loudspeakers that hark back to earlier Audiolab and TAG McLaren products. In its literature, Audiolab (redux) comments that amplifiers of today are similar to those of a decade ago while CD players have changed significantly. Indeed, it's certainly true that new digital-to-analogue (DAC) chips and generally higher levels of integration made designing high-quality digital audio devices easier. A pretty good hint at that can be got by looking under the lid of this neatly presented player, for the audio board is very modest, bearing a recent DAC from Cirrus Logic, analogue filtering and buffering components, power supply regulation and a few bits associated with digital output (on both phono and BNC connectors plus Toslink), all in an area of around 65cm2. The reduction in area from a much larger equivalent board in older products is mostly down to the use of miniature surface-mounted electronic components. The main sound production blocks are still conceptually similar to those of 20 years ago: the filtering is done partly by oversampling and partly by analogue filters and the analogue stages in particular have changed very little in layout. The biggest change is in the internals of the DAC, where modern design techniques allow considerably higher performance with respect to such features as low and high-level distortion and jitter than were common in early players. One interesting feature of the DAC used here is that it has two filter settings available, 'slow' and 'fast' attenuation types with the former allowing more ultrasonic distortion through. Audiolab has taken the opportunity to offer both of these to the user of the 8000CD. Most people who have experimented with filter selection will agree that the differences between them can often be quite significantly audible, but strictly speaking, the slower roll-off types are less accurate. Unfortunately, as is almost invariably the case, even the 'fast' filter here is not quite up to the mark by our reckoning but, given that, it's actually good when compared with the general run of digital audio components. We used 'fast' for most of our listening, finding it a little clearer generally. That apart, you get a pretty much standard feature set with this player. Given that it boasts a nice high-resolution dot-matrix display, we were disappointed that it doesn't make any use of CD-Text information, but it does read finalised CD-RW discs. Thanks to the audio-only transport (apparently custom-made for this product) disc reading is fast and mechanical noise is very low, indeed barely audible under any circumstances, even with one's ear close to the machine. The front panel buttons are obviously a bit of a feature which some will hate: they move a long way against a moderately strong spring before finally operating with a last little click. It prevents accidental operation all right, but takes a little getting used to. We got quite fond of it by the end! From the very first track spun, we were impressed by the player's unfussed presentation. However, we were also underwhelmed by the fine detail it revealed, and on the whole we continued to feel that way about it through a wide selection of tracks over a relatively extended review period. In these days of basically decent baseline performance from CD players and general lack of obvious flaws, 'presentation' is an increasingly important parameter. It's the overall impression, experienced as a summation of various little character traits. Some of these are so minor that only the fussiest listener would bother to enumerate them. That's particularly true in this case, we'd say, as by 'unfussed', we mean that the sound is nicely present without unnatural emphasis on any tonal or other aspect. It's the sort of sound that, in a nutshell, makes one quickly think, 'Ah yes, very satisfying'. That said, we identified some specific pros and cons around the 8000CD. Among the pros, we would have to include the bass. It will not necessarily please those who like bass to be really stomping, but it has firmness and extension that, on extended listening, proves probably more pleasant, and certainly more realistic, than low-frequency exaggeration. It also has an exceptionally tuneful quality that helps reproduce low-lying melodies with the same aplomb as percussion and sound effects, and with considerable grace, too. Tonally, the midrange and treble seem very fine too; the former not favouring one particular voice range or instrument, the latter sweet and free from the dreaded dryness and constriction that can so weary the listener. But as mentioned above, we never quite convinced ourselves that all the detail in well-made recordings was coming through. Image width is no problem for the 8000CD, which is both extended and specific in that regard. Depth, however, seemed a little uncertain, the more so as textures thicken and more instruments are added. At the same time, instruments became less clearly differentiated and their individual lines less easy to follow. Throughout, the bass remained calm and unflappable, which is a welcome result but we'd have been just that little bit happier with more information at higher frequencies. We've had similar findings in the past with various items of kit and, as on those occasions, we feel that the 8000CD's success depends to some extent, on the music one plays through it. As you'd expect, simpler musical styles show it off to best advantage and if your tastes run to, say, ballads or jazz trios you'll probably find it a corker. Even so, a drum kit can add up to quite a few instruments and modern studio recordings of outward simplicity can features plenty of background information, which could end up clouding the essential issue. We found a clue for this in rising levels of distortion with frequency. Audiolab has done an great job in measured terms, but high frequencies don't pass quite as cleanly as we've seen and we're inclined to point the finger there. Measurements may not tell the whole story, but when they tie in with subjective testing, it looks more than just coincidence. We're inclined to offer the 8000CD a cautious rather than fulsome welcome. 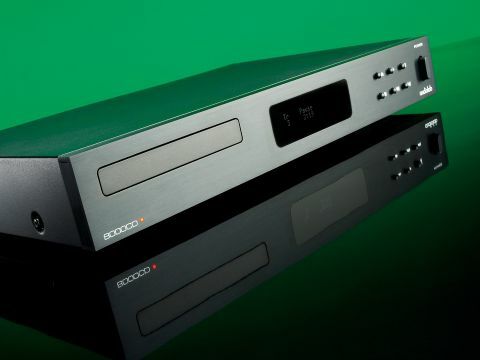 £600 is a pretty well-stocked price point for CD players, but then again, none of the direct competition truly offers excellence in every area and this one has some good qualities in a unique blend that will appeal. Recommended with just that caveat about detail.